In this lesson we will learn the notes that correspond to the various keys on the piano keyboard. Take a look at the keyboard in the picture below. Firstly, you will notice that the keys are black and white. But if you look more closely you will notice a pattern with the black keys. You will notice that the black keys follow a pattern of two keys followed by three keys, followed by two keys, then three keys and so on. Two black keys, three black keys, two black keys, three black keys and it goes on and on depending on the number of keys that the keyboard has. In this 88 key-piano you can see that this pattern of black and white keys repeats several times. Once you understand the pattern of two keys followed by three keys, it's not hard to label the piano keyboard, no matter the number of keys it comes with. Okay. So let's start with the note, C. Where is C located on your piano? In the image below we can see that it's just before the set of two black keys. Here's an image with three C notes on the keyboard. Each time, it's clear to see that C falls just before a set of two black keys. Each C is 8 notes or one octave apart. Now that we know where C is on the keyboard, it's easy to find the other notes. The key after C is D, followed by E, F, G, A and B. Then we go back to C, D, E, F, G, A, B and so on. It keeps repeating according to the number of keys on your keyboard. Just move in alphabetical order. The musical alphabet is from A to G. Seven letters. So there's no H. After G, you go back to A. Take a look at where F is located on the keyboard. While C comes right before a set of two black keys, F comes before a set of three black keys. So we now know the notes of the white keys. How about the black ones? Just like the white keys, the black keys are named after the first seven letters of the alphabet except for one thing. These black keys can be either sharp of flat. For example, the key to the left of D can be called D flat. But since it is to the right of C it can also be called C sharp. In simple terms, sharp means to go higher while flat means to go lower. Flat indicates moving to the left of your piano while, sharp indicates moving to the right. Sharps and flats are called accidentals. The black keys in order are C sharp (or D flat), D sharp (or E flat), F sharp (or G flat), G sharp or (or A flat) and A sharp (or B flat). It's really 5 black keys being repeated over and over again. When you think of it this way, it's really simple. What we have discussed so far is really a simplified approach to piano notes. 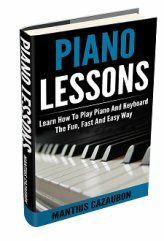 As a beginner, this is all you really need as far as knowing your piano keyboard is concerned. But let's take things up a notch and talk about enharmonics. This means that keys can have different names. One key on your piano can have more than one name. In reality notes and keys are not the same. 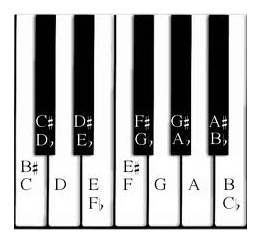 Strictly speaking the keys on your keyboard aren't actually called A, B, C, D, E, F, and G. They just play these notes. This is why the black key to the immediate left of D can be called C sharp or D flat. C sharp and D flat are enharmonic equivalents. D sharp and E flat are enharmonic equivalents. 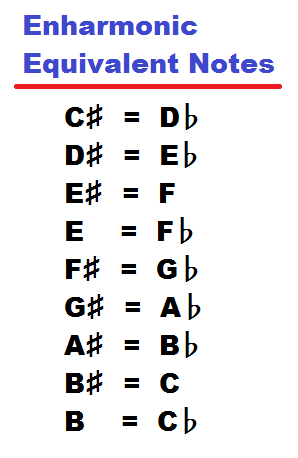 F sharp and G flat are enharmonic equivalents. And so on. You will find this particularly useful when learning to read music. White keys also have enharmonic equivalents. The key that corresponds to the note C on your piano keyboard can also be called B sharp. E can be called F flat. B can be called C flat. And so on. As we said earlier, sharp simply means to go higher and flat means to go lower. All we're doing is going higher or lower by a half step. There are 88 keys on a grand piano. There are 52 white and 36 black keys. The first note is A. Most digital pianos have 88 keys while other keyboards can have 49 keys, 61 keys, 76 keys and so on. It varies. But most keyboards have either 61 or 76 keys. I trust that you have a better understanding of the notes and keys on a piano keyboard. 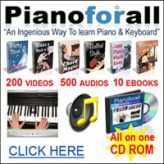 Go here to learn about the best course I've seen for learning to play keyboard and piano. It's called Piano For All.